Evaluating website quality : Five studies on user - focused evaluation methods The benefits of evaluating websites among potential users are widely acknowledged . There are several methods that can be used to evaluate the websites â quality from a users â perspective . In current practice , many evaluations are executed with inadequate methods that lack research - based validation . 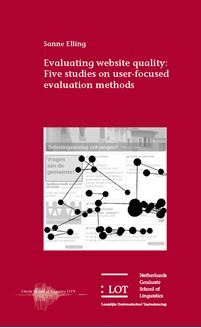 This thesis aims to gain more insight into evaluation methodology and to contribute to a higher standard of website evaluation in practice . The studies in this thesis consist of research on three user - focused evaluation methods , which were studied within the context of municipal websites . Two methods evaluate the websites â quality by measuring the users â opinions : the â Website Evaluation Questionnaire â ( WEQ ) , and the â user page review â method which invites participants to review website pages . The third method , the think - aloud method , measures website quality during participants â task performance . We studied two variants of this method combined with eye tracking : the concurrent think - aloud method ( CTA ) , which involves participants who verbalize their thoughts while performing tasks , and the retrospective think - aloud method ( RTA ) with participants who verbalize their thoughts afterwards while watching a recording of their performance .